We will start this bench grinder review looking at all the features the DW758 8-inch bench grinder is packed with. Starting off it is an 8-inch model which means it is larger than some other standard models. This is a key feature because that means it has more power and can also use larger wheels. Larger wheels allow for you to remove more material more quickly and more power means that you can work on harder materials such as titanium. The motor in this bench grinder is a three-fourths horse power, which puts this near the top for power making it one of the best bench grinders. Due to the large motor the grinder will run at 3600 rpm. The motor also has overload protection which is a really helpful feature. This feature keeps the motor from overheating which really extends the life of this table grinder. The motor housing is also made out of durable material and has a solid cast iron base to help keep it stable. On top of the overload protection the wheel housing have rear exhaust ports which help even more in preventing things from overheating. Not only is it important to keep the motor cool, but it is also important to keep the wheels cool so they do not explode. Also, by keeping the wheels cool it helps keep the material you are working on cool so that you can work longer and more efficiently. Another way the DEWALT 8 bench grinder keeps you working more efficiently is the precision-machined aluminum tool rest. These allow for accurate position of the things you are working on to get the perfect angle so you get the right smoothness or right tip on whatever you need too. There is also a twelve and a half inch distance between the wheels which allows for larger and longer grinding applications. This is really useful if you are wanting to use the grinder to sand down a piece of wood or if you are repairing the edge on a mower blade or longer tool. Another reason why this is one of the best bench grinders on the market is the tool-free adjustable guard. Being tool-free allows for quick adjustments and also installation. This is important because the guard is one of the first lines of protection you have when using a bench grinder. 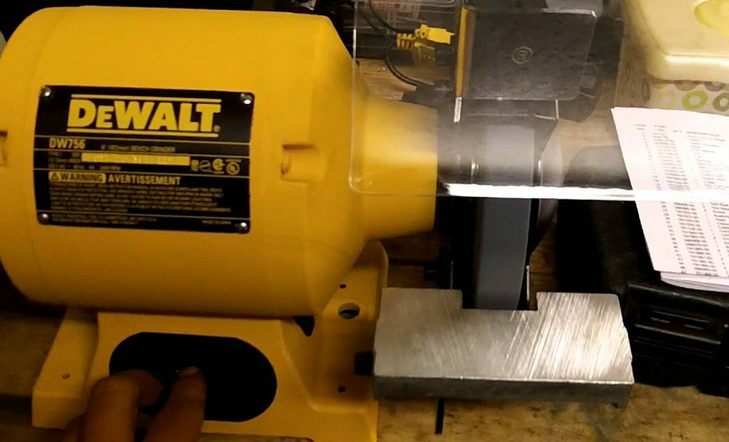 The DEWALT DW758 Bench Grinder is one of the larger ones on the market weighting in at 40 pounds, but this is one reason why it is so stable and doesn’t wobble. It also comes with a 36 grit and 60 grit wheel and has a wonderful three year warranty. Reading about all these features in this bench grinder review should really make it stand out that this bench grinder is one of the best bench grinders on the market. Not only am I saying that the DEWALT bench grinder is a great in this bench grinder review but other people agree too. It has over three hundred reviews on Amazon, so this bench grinder really should be on any best bench grinder list. The current star rating is 4.2 making this one stand out above the crowd. The price is extremely competitive compared to other 8-inch bench grinders and is a great deal considering all the features. Most users really love how quiet this unit runs. They also love how long the unit will last you with proper care. Many mention how much of a beast this unit really is. The wheels won’t bog down even with heavy load. You can do heavy auto fabrication with this unit no problem. This unit is powerful and not like most home units and most people mention how it is a great value. With that said you do have to keep in mind that 8-inch table grinders can be too large for some peoples needs and you might want to consider the DEWALT 6 Bench Grinder if that is your case. The negative reviews on this bench grinder are all pretty similar. This bench grinder can have quality control issues like any other product. Sometimes the wheels for this bench grinder are shipped out of round. Also, the washers that help hold the wheels onto the housing are stamped metal meaning they are thin and not always truly flat. If the one you order comes with none flat washers the wheels will wobble when trying to use it. These issues though should not knock this from being on your list of potential best bench grinders for you it is just something to keep in mind. Only a small fraction of people have this problem and most bench grinder reviews of this product are positive. Even though the DEWALT 8 inch bench grinder has a great warranty one of the advantages of buying it on Amazon is they have great buyer protection, so if you do get a unit that has issues you can always return it. Also, buying on Amazon is convenient as the tool gets delivered right to your door in a few days and you don’t have to spend time driving around trying to find a store with this table grinder in stock.